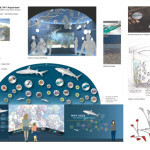 Graphical renderings of the “Ocean Wonders” exhibit and features at the NY Aquarium. Image courtesy of Naomi Pearson, EGAD at WCS. In the post she “introduce[s] a few complex and exciting digital preservation challenges [she’s] encountered in each department” that she is surveying for the project.